Preheat the oven to 350 degrees. Spread the beets in a cake pan and cover with aluminum foil. Bake the beets until they are tender, about 1.5 hours. Let the beets cool slightly, then peel and cut them into 1/4-inch-thick strips. In a large bowl, combine the lemon juice, olive oil, paprika and cumin. Add the beets and toss to coat. Season the salad with salt and toss again. Serve the salad at room temperature or slightly chilled. cover eggs with cold water and bring just to a boil. cover, remove from heat and let sit 12 minute before draining. peel and quarter. For the gressing, stir together the chopped scallion, mayonnaise, sour cream, vinegar, 3 tbsp, of water and salt and pepper to taste. cut ham, turkey and cheese into strips Tear lettuces into pieces and combine with watercress in a salad bowl. Arrange eggs, meats, cheese and tomatoes on top of greens. pour dressing over all and toss gently. Mix salad ingredients in order given, crushing uncooked noodkes and saving seasoning packets for fressing. Recipe Note: *The original Broccoli Slaw recipe uses chicken ramen noodles. For the lenten version, use the shrimp or mushroom noodles. Separate cauliflower into florets and cook until tender-crisp. Do the same with the broccoli. Note: The broccoli stakls, peeled and sliced, may be inclided, if desired; otherwise, peel and slice lenghtwise to be eaten raw (good on your relish vegetable plate). wisk the dressing ingredients together. Toss with the cooked and cooled cauliflower and broccoli flowerest and chopped green onions. garnish with cherry tomatoes. 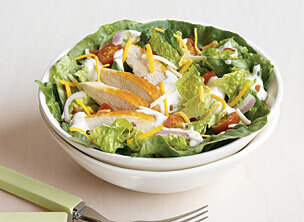 Toss lettuce, chicken, tomatoes, onions and 1/2 cup of the cheese in large bowl. Top with remaining 1/2 cup cheese and the bacon.